Save 30% OFF stand up paddleboard rentals in the Destin Harbor thru 6/25 (10% OFF after 6/25). Try out this new sport that is taking the Gulf Coast by storm! Easy to learn and great for exploring the waters. Book your destin paddleboard rental online on TripShock today! The Destin Palms Resort is offering a fantastic deal for the Summer season. Receive Four Free Dolphin Cruise Tickets ($100 value) Plus $50 Gas Card for any 3 night stay valid for stays now to Aug 9. Save up to 50% OFF this package on a 3 night stay! The Destin Palms is located just north of Henderson State Park and offers upscale accommodations. The large resort sized pool is perfect for families and the lobby features a hotel restaurant that is open daily. 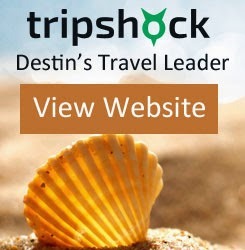 Book the Palms of Destin today on TripShock.com for this offer.